Computers are part of our daily lives: From households to offices, and from schools to colleges, we use them everywhere. And based on individual/organizational requirements and needs, we run many different types of software programs on these powerful machines. These software programs include everything from music players to office suites. But even though paid and proprietary (e.g. Microsoft Office) software programs are great, the open-source software world offers a lot of exciting stuff. So what exactly does open-source mean? Simple speaking, open-source software is something that can be freely modified, edited and redistributed without any copyright issues. And there are quite a few cases where you may want to use these types of programs. For instance, you may need a slightly-tweaked version of a data analyzer software to suit your project's needs. Such tweaks are only allowed when you use an open-source data analysis program. You may also want to use open-source software programs for accounting, time tracking at work or even data recovery. With so much to learn about open-source software, it can be hard to know where to start and decide which programs are worth your time. To help cut straight to the chase, we did some research and put together a useful list of the best open-source software programs to download right now. External hard drives and cloud-storage services are no doubt good, but optical discs (e.g. DVD, Blu-ray) remain the best medium for distribution and long-term storage of digital data. Disc burning software makes it easy to transfer regular files, high-definition movies, etc. to optical discs, and Cdrtfe is perfect for the job. Completely free, Cdrtfe is an open-source burning application for Windows. It fully supports all CDs, DVDs and Blu-ray discs. Apart from that, you can also burn data discs, Audio CDs, XCDs, (S)VCDs and DVD-video discs. Cdrtfe can create bootable discs and burn ISO images. It even supports writing simultaneously to multiple writers. With Cdrtfe, you can create multi-session CDs, as well as extract audio tracks to .wav, .mp3, .flac and .ogg files. The program can erase (both quick and full) rewritable discs, and be used with command line options for better control. 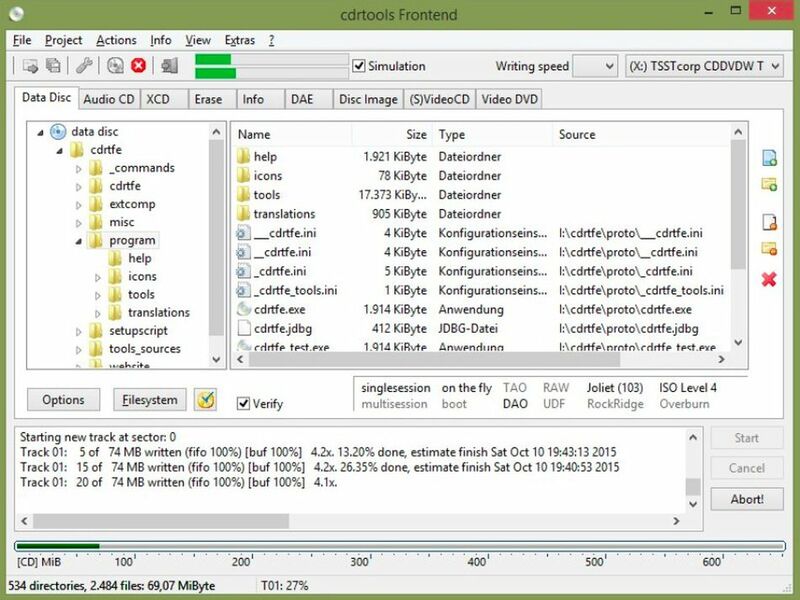 Cdrtfe uses cdrtools and other modules as a backend, and can even be integrated with Windows Explorer via ShellExtension. Thanks to their advanced video recording capabilities, modern-day smartphones have made shooting high-resolution videos a cakewalk. That said, you still need a video editor program to transform raw footage into stellar-looking videos. One such program is Shotcut. Filled to the brim with features, Shotcut is the best open-source video editing software out there. It supports all the latest audio and video formats, as well as popular image formats like .bmp , .gif , .png and .svg. Shotcut has native timeline editing and frame-accurate seeking features. Webcam and audio capture is supported, as is network stream playback. Shotcut lets you do compositing across video tracks, and uses HTML5 as video source and filters. There are numerous built-in transitions (e.g. Barn, Diagonal), blending modes (e.g. Saturate, Exclusion) and a vast array of video filters. You can add speed effect for audio/video clips and even reverse them. Speaking of audio, Shotcut supports audio mixing across all tracks. Its collection of audio filters includes everything from bass and treble to reverb, and there's support for up to 5.1 surround sound. As for editing features, Shotcut features multitrack timeline with thumbnails and waveforms. You can fully manage MLT XML projects, and detach audio from video clips. There's unlimited undo and redo, three-point editing and much more. A cross-platform application, Shotcut is available for Windows, Linux and macOS. If you've ever deleted an important file by mistake at the office or had an OS crash wipe out your computer's hard disk, you already know how important it is to have a good data recovery program at hand. Enter TestDisk. An extremely powerful open-source data recovery software, TestDisk has been designed to help recover lost partitions and make non-booting disks bootable again. The software can easily recover deleted partition tables as well. TestDisk can be used to fix FAT tables, recover FAT32 boot sector from backup and rebuild FAT12/16/32 boot sectors. It can rebuild and recover NTFS (new technology file systems) boot sectors, too, and lets you fix MFT using MFT mirror. Furthermore, it can be used to locate ext2/ext3/ext4 Backup SuperBlock, and undelete files from all popular file systems such as FAT, exFAT, NTFS and ext2. The files from deleted FAT, exFAT, NTFS and ext2/ext3/ext4 partitions can also be copied. Efficient use of time is essential for the successful execution of any task, and computer-based activities are no exception. Time-tracking software applications can be used to record the time taken by an employee/team to finish a task or project. If you're looking for the best open-source time-tracking software, look no further than eHour. A Web-based, time-tracking tool, eHour is ideal for companies that need accurate information on how much time employees are spending on projects. It allows you to create multiple projects per customer, and assign multiple users to a single project. That's not all. eHour can be used to create default projects to which all users should be assigned. It's possible to configure days off, sick leave, etc., so they can be tracked, too. eHour has extensive reporting features and full separation of user roles (e.g. project manager and administrator.) You can lock timesheets, generate an Excel summary of all reports and even configure automatic email reminders. Whether you're an individual or a business owner, it's important to keep track of your (or your company's) finances. There are many financial-accounting programs that can help you do that, and GnuCash is one of the best. GnuCash is an open-source personal and small-business accounting software. Easy to use yet powerful, GnuCash lets you track bank accounts, stocks, income and expenses. It's based on professional accounting principles and thus, ensures balanced books and accounts reports. Featuring a double-entry bookkeeping system, GnuCash has a checkbook-style register that provides a convenient and familiar interface for logging financial transactions. You can enter split transactions and have multiple accounts displayed in a single register window. A summary bar shows all of the relevant account's balance information. GnuCash lets you configure recurring transactions and set up automatic reminders for due transactions. An integrated module makes it easy to display financial data as bar charts and more. The program can also be used to track stocks/mutual funds and supports multiple currencies. Typically, an audio editor is a software that only professionals who are involved with music/audio production require. However, regular users can also use it for things like converting analog audio to digital tracks. Regardless of the category you fall in, Audacity is just what you need. Among the most-popular open-source software, Audacity is a cross-platform audio editor. It lets you digitize recordings from other media and can capture streaming audio as well. You can dub over existing tracks to create multi-track recordings, and record multiple channels at once. Audacity supports sample rates of up to 384,000Hz. From .wav to ​.ogg, Audacity supports just about every audio format out there. You can import and export raw files, and export .mp3 files with its optional LAME library. For editing, Audacity has unlimited undo and redo support. Its Draw tool lets you alter individual sample points, while the Envelope tool can be used to smoothly fade the volume up/down. Audacity supports numerous plugins like LADSPA, LV2, Nyquist and Audio Unit. There are also several experimental modules that can further improve its functionality. Tracks and selections can be fully manipulated via keyboard, and there's a range of keyboard shortcuts available to further ease things up. In today's always-online world, it's not enough for you (or your business) to have a website. That website also needs to stand out from the competition. There are many feature-loaded Web design applications that you can use to create great-looking websites, with OpenElement being the best open-source software. OpenElement features an intuitive user interface and lets you edit just about every aspect of your website. It uses managed code and has multiple page layers for easy web designing. There are many reusable styles and element packs that you can take advantage of, and OpenElement supports HTML5 and CSS3. Having cross-browser compatibility, OpenElement lets you design responsive websites with full CSS customization. Its element editor can be used to create and share elements, and there is an easy integration of scripts. There are also many DB-powered element packs that can be installed. An SEO and site quality assistant let you improve the website's design for better rankings on search engines.